We utilise innovation and sustainability to help our customers protect people and the environment by creating the world’s cleanest and safest workplaces and communities. We source cleaning & hygiene products and ensure they are delivered on time so that facility management teams can create safe and clean environments that protect people whilst they are away from home. Our Advantage platform is a digital solution with an exceptional blend of digital capabilities, outstanding service and top-quality products. We have a market-leading solution for you, giving you unique cost control and approval procedures online. Your personal login provides access to your specific range of contracted products, ensuring you are buying at the best price every time you place an order. Ability to restrict certain locations, contracts or users to a specific range of products, ensuring you have full compliance and no Health & Safety issues on site. We ensure that the products we supply meet all the required legal and professional industry standards. We work with many global partners to provide a wide range of quality products from industry-leading manufacturers, who constantly offer you innovation and great choice. Getting your product range right is essential to improving efficiency and productivity on site. The environment – We supply the most innovative sustainable products that are available in the UK. We stock complete ranges of cleaning solutions that harness friendly bacteria and enzymes that clean without the use of chemicals. We sell carbon neutral paper products made from highly sustainable bamboo and soap made by a social enterprise company that uses partially sighted team members in its factory. Our facilities: All of our electricity we use in our offices and warehouses comes from 100% renewable sources. We are fitting LED lights to our buildings and have active programs to reduce waste to landfill. We utilise a state-of-the-art vehicle telemetry routing system that ensures every vehicle within our fleet uses the most efficient delivery run each day to ensure that traffic idle time and vehicle mileage is constantly minimised so that the CO2 emitted by our vehicles is kept as low as possible. Our people: We proudly have a highly sustainable approach to our team members. Wherever possible we promote from within and recruit and develop our own talent. We utilise a leading online training portal that all team members have access to so they can develop their own skills and learning. Our customers: By supplying a complete range of sustainable cleaning products we help protect cleaning and facility management staff from the potentially harmful effect of long-term exposure to cleaning chemicals. Our community: From our Head Office to each corner of the UK covered by our branch network we are active in our local communities. From individual fundraising to branch fundraising and charitable work we are very proud of the social value that we give back. Our national Charity of the Year is MIND who we proudly support. Innovation is at the heart of everything we do. We are constantly searching for the market’s most innovative products and solutions. If they pass our strenuous Innovation Panel which is made up of a team of very passionate experts from within BCHS by demonstrating they have real innovative qualities and features, we then feature them in our market-leading publication Innov8 which we publish on a quarterly basis. Many of the products we have featured in Innov8 have been an award or multi award-winning products and we pride ourselves with being the first supplier to take them to the market and showcase them to our customers. 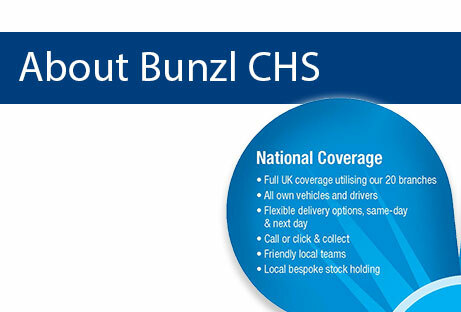 With 19 branches across the UK, we can guarantee that there’s a Bunzl Cleaning & Hygiene Supplies branch near you. We offer fast, timely delivery, for free on all orders over £50, plus the option to collect your order in person. Having our own fleet of distribution vehicles and field sales technical support enables us to provide fast-response support to your business too, and an unparalleled level of local customer care with the seamless efficiency of a national company. Whatever the size, type or location of your business, we’re here to meet your needs, right when you need us. We have a complete range of exclusive brand products including Cleanline cleaning products, CleanWorks cleaning equipment and Pristine washroom products. 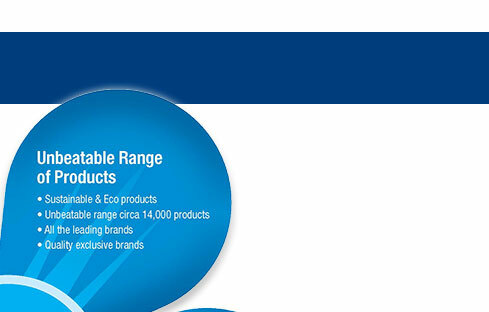 We are also proud suppliers of over 14,000 products from leading brands and manufacturers including Diversey, 3M, Kimberly-Clark, Vileda, Procter & Gamble, SCA and Deb, to name but a few. Our close partnership with these brands means that our business customers benefit from their industry expertise and technical support as well as that of the Bunzl Cleaning & Hygiene Supplies team. At Bunzl Cleaning & Hygiene Supplies we don’t just deliver our goods; we can also offer advice, training, technical support, product use reporting, and product dispenser provision and fitting to our customers so that they can make the most informed and profitable decisions for their business, and get the very best out of our products and resources.